Let's check out a few wireless shutter controllers available for Sony cameras. 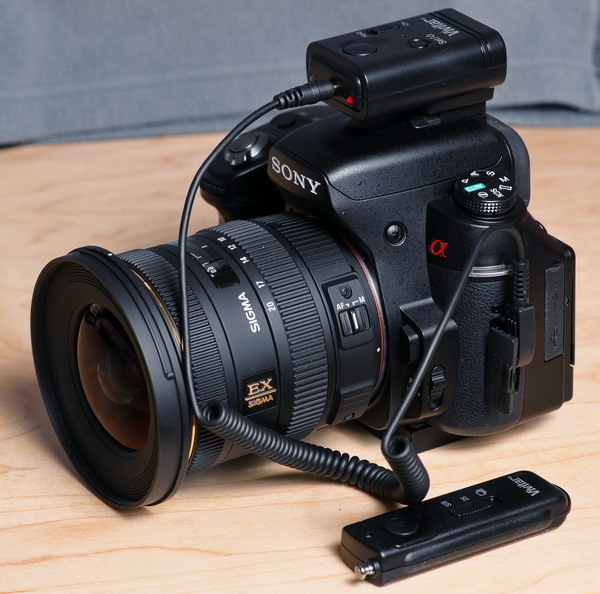 If you own a Sony DSLR or SLT camera, your choice of wireless shutter controllers is limited. 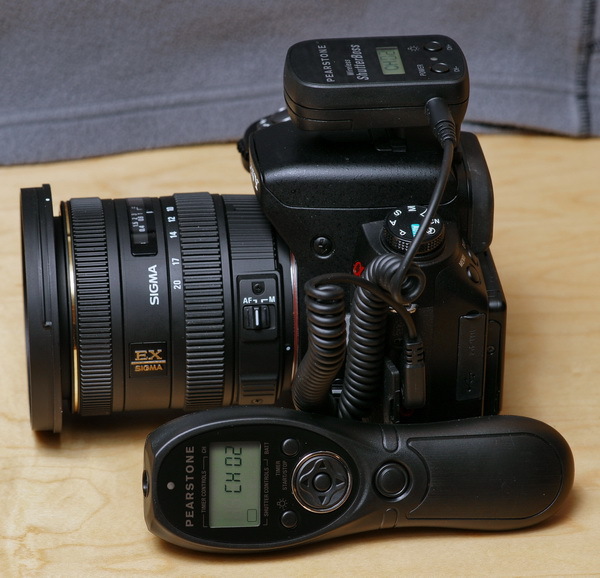 In fact, as of this review, there is only one Sony wireless shutter release, the RMT-DSLR1, which has a bunch of buttons, but only two are used for the Camera shutter, one operates the shutter instantly, the other starts the two second timer, there are no other options, the rest of the buttons are for TV viewing. Also, you must be pretty close, and facing the camera front for it to work, as the remote sensor receiver is in the camera's forward hand-grip. The maximum range is around 50' (15m). You might ask yourself; why do I need a wireless shutter controller? Long exposures at night with telephoto lenses will show blur in the picture if you punch the shutter button or otherwise jitter the camera. The wireless shutter will allow you to trip the shutter without touching the camera, thereby keeping the camera still, (although you could do that with a corded remote). Another scenario; say you have some really neat looking birds or weird animals that come to your water fountain in the morning and you want to get a good shot of them without being visible and possibly scaring them off. You put your camera outside (or aim it through the windows) in the proper position, and wait in the comfort of your easy chair for the critters to come, then snap the shot using the transmitter. Another option is to use the interval timer (if it has this feature) for taking a shot every thirty seconds, or each minute for one hour etc, so you don't have to be bothered with being there and waiting, you could go back to bed and hope something turns up later in the pictures. There are several full featured, and inexpensive after-market shutter controllers out there for Sony shooters, and I've reviewed some below, so let's get started! Vivitar VIV-RC-200-A700 Now called 'vello'. Vivitar Vello offers this inexpensive remote shutter release model, which features instant, bulb, two second and continuous shooting modes. When you half-press the transmitter button, it works in the same way as the camera's shutter button, it meters and focuses, and a full press actuates the shutter. It comes with a CR2 3V battery for the receiver, and a small 12V 23EA battery already installed in the transmitter, both are pretty common and easy to replace. The listed unobstructed range is 320' or (98m), but my copy would not work at distances beyond about 100' or (30m). The signal will travel though walls, but the range goes down significantly depending on how many walls are between the transmitter and camera receiver. I tested it in an enclosed room with a window, transmitting to the out-of-view receiver, outdoors, at a distance of about 25' (7.6m) and it worked well. The Vivitar Vello shutter controller uses the same remote camera plug style that Minolta came out with in the 1980s. Of course, it's also compatible with Sony DSLR's and SLT cameras. Here's what it looks like mounted on a Sony A580 camera. The transmitter is the small devise on the side with the telescoping antenna, however, it doesn't seem to make any difference if it's extended or not. The receiver is mounted on the camera's hotshoe, it has the Sony proprietary mount. You don't need to mount it here, there is no power used from the hotshoe, it's just a convenient place to keep it. One thing about turning on the receiver, you press and hold the "set" button 3 seconds until the red LED comes on, I didn't do that and initially thought the unit was bad. Do the same to turn it off. There is no on or off setting on the transmitter, it doesn't use power unless the button is pushed. 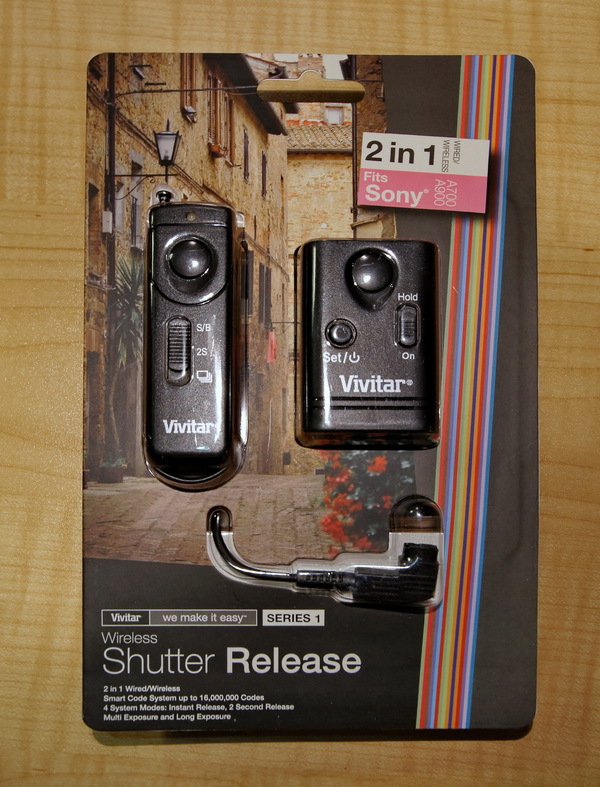 The Vivitar Vello shutter controller uses the same remote camera plug style that Minolta came out with in the 1980s. Of course, it's also compatible with all Sony DSLR's and SLT cameras. Pearstone Vello offers this full featured model, called the ShutterBoss, and it includes automated controls covering; instant, bulb, two second, continuous shooting, interval, delay, timer control and much, much more. When you half-press the transmitter button, it works in the same way as the camera's shutter button, it meters and focuses, and a full press actuates the shutter. It comes with a CR2 3V battery for the receiver, and two small AAA batteries for the transmitter, both are common and easy to replace. The listed unobstructed range is 250' or (80m), but my copy would not work at distances beyond about 200' or (60m). The signal will travel though walls, but the range goes down significantly depending on how many walls are between the transmitter and camera receiver. I tested it in an enclosed room with a window, transmitting to the out-of-view receiver, outdoors, at a distance of about 25' (7.6m) and it worked well. Make sure you have the channel number on the transmitter and receiver set the same, otherwise it won't work. The unit should be set properly when you first turn it on, but has instructions for resetting it if you need to. I messed around with my copy so much I screwed up the factory settings, and had to reset everything for it to work right. The Pearstone Vello ShutterBoss uses the same remote camera plug style that Minolta came out with in the 1980s. Of course, it's also compatible with Sony DSLR's and SLT cameras. Here's what it looks like mounted on a Sony A580 camera. The transmitter is the TV remote looking devise on the side with the LCD. The receiver is mounted on the camera's hotshoe, it has the Sony proprietary mount. You don't need to mount it here, there is no power used from the hotshoe, it's just a convenient place to keep it. There is no on or off setting on the transmitter, it doesn't use power unless the button is pushed, and the LCD goes off after a couple of minutes. 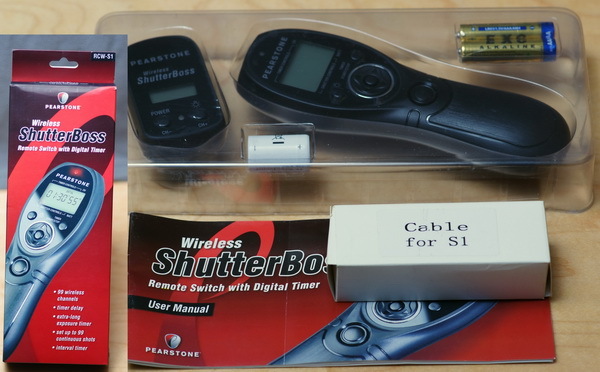 The Pearstone Vello ShutterBoss uses the same remote camera plug style that Minolta came out with in the 1980s. Of course, it's also compatible with all Sony DSLR's and SLT cameras.